In addition to the wave of FIA GT news posted on February 24, there is some additional entry news regarding the 2006 Championship. Having raced a Seikel Porsche, with Philip Collin, in the 2005 LMES, the father and son Felbermayr pairing is switching back to the FIA GT Championship for 2006 – in association with another father-son pairing, the Rieds (Gerold and Christian). 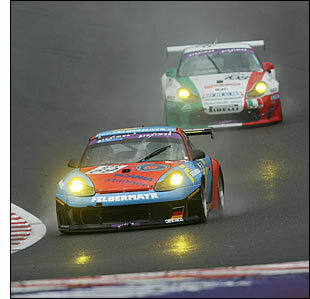 The two families raced together, in the Proton Porsche, in the 2005 Proximus 24 Hours of Spa (right), and the Rieds raced together throughout the 2005 FIA GT season, in the Proton Porsche. For 2006, the four of them will race two Porsches, in the colours of Team Felbermayr, and will combine again at Spa for the 24 Hours. Racing in a full season this year will be the G2 Gillet Vertigo – which currently looks as though it could be heading for a clean sweep of the class (the G2 Class Spirit Mosler having been replaced by a Saleen). “We have changed the front brakes, lowered the centre of gravity, altered the rear axle and generally optimized the settings to make the car more competitive. 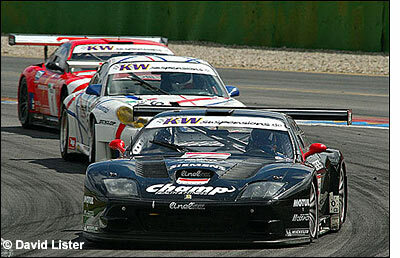 Our aim is to be around the middle of the best GT2 cars.” A 4 litre engine should help the Gillet cause this year. Bas Leinders and Renaud Kuppens are likely to race the car again. SRO has confirmed that it has a new agreement in place with the software development company Simbin, lasting until 2011, and the latest racing game, GTR2, will be available soon – based on the 2004 FIA GT season. GTR2 will include over 140 highly detailed cars, including all the GT and N-GT cars from the 2004 season. The tracks include all the 2004 circuits, as well as those from previous seasons.